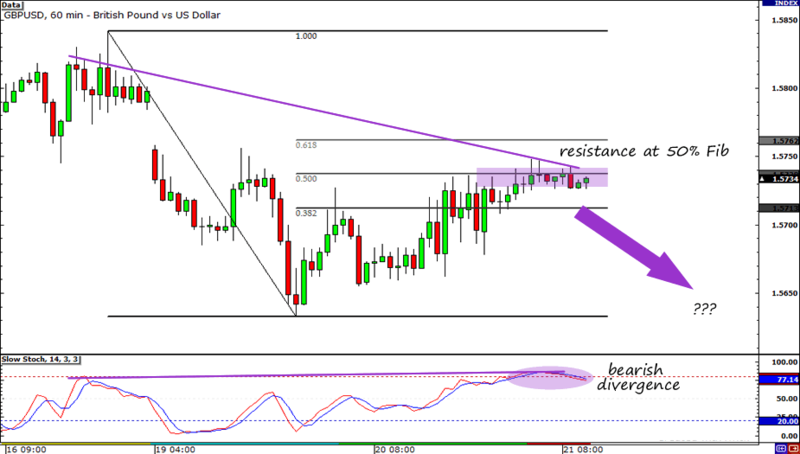 Bearish Divergence and Fib Play on Cable – Winner! Success! After hitting my first profit target early in the London trading session yesterday, I decided to finally close my entire position for a huge 325-pip profit! Who’s the… uhh, woman?!? Hah! Sorry guys, but I am just so happy! My technical and fundamental analyses were spot on and I was able to catch the entire move down. The pound was hit by two big blows, one from the MPC interest rate decision and the other from the Fed’s announcement of Operation Twist. Phew! I’m definitely a very happy girl right now! Still, I have to keep my guard up because trading doesn’t end after one trade. I have to keep going and find those great setups to take my account balance even higher! And I’m in! I got tired of sitting in the sidelines so I jumped in and shorted GBP/USD at market when I saw that the 50% Fibonacci retracement level was holding. With Stochastic also showing a bearish divergence, making higher highs while price is making lower highs, I feel that this trade is going to make me a very happy girl. I have to admit that I’m a bit scared though. I’ve been told that weekend gaps always get filled and as you can see, the one on GBP/USD is still there. 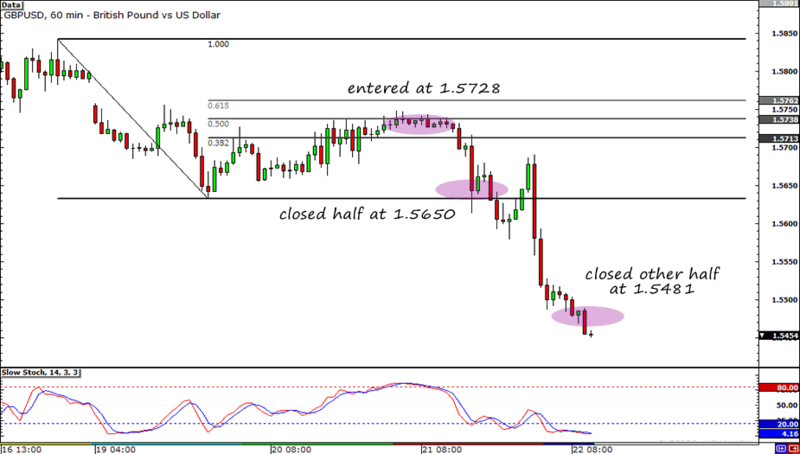 So to be safe, I just placed my stop safely above the gap, around 100 pips from my entry. Fundamentally, I have a bearish bias on the pound too. I believe that the upcoming MPC meeting will be bearish once again. The number of members who wanted a rate hike has fallen to 0 from 2. In addition, there are rumors floating around that another round of quantitative easing is possible. As for the Greenback, the Fed is expected to opt for Operation Twist instead of good ol’ quantitative easing in its next interest rate setting annoucement. If you want to know more about it, just head on to Forex Gump’s blog. Forex Gump did an excellent preview of the upcoming FOMC statement yesterday. I shorted GBP/USD at market (1.5728) and placed my stop at 1.5830. I’m going to take profit on half of my position at 1.5650. My second profit target will be determined as my trade plays out.